The Gray Iron Fitness Newsletter, Issue #029, Success Secrets Revealed. Kettlebell Humor. In today's November 11, 2009 newsletter . . . 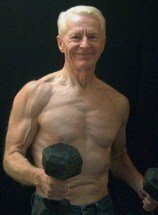 The Senior Exercise Central website has a page called "Muscle stories," which includes interviews and stories about strength and fitness buffs; most of them, but not all, are seniors. I think the feature is one of the most interesting sections on the website. Three stories in particular come to mind right now. All are about mature trainees, ages 66, 71, and 77. All live fitness lifestyles and have vibrant lives. Any senior beginner will certainly profit from reading their stories. And those of us who have been training for a long time can always learn something new. Moreover, I’ve found that fitness enthusiasts at any age are just plain curious about people who share their passion. One man, Terry Overstreet, is relatively new at training, having begun in 2007. He has made amazing progress. The other two, George Boedecker and Bob White have trained their entire adult lives. Each takes a somewhat different approach to his training and dietary practices. What they all have in common is combining some system of resistance training with cardiovascular work. And though their dietary practices vary, you will discover that no one overeats or consumes highly processed or junk foods. So while their different approaches highlight that one size does not fit all, certain fundamentals are almost universal. P.S. If you have your own fitness story and training information to share, great computer skills are not required. Just click on "Your Stories" and use the easy-to-follow form. Humor is healthy and this video is guaranteed to raise your spirits. P.S. Discover serious information about kettlebell training here.